Old Dominion University, also known as ODU, is a public, co-educational research university located in Norfolk, Virginia, United States, with two satellite campuses in the Hampton Roads area. It was established in 1930 as the Norfolk Division of the College of William & Mary and is now one of the largest universities in Virginia with an enrollment of 24,670 students for the 2014-2015 academic year. 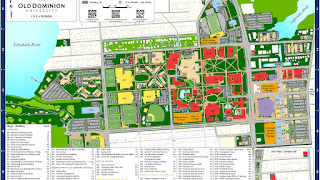 Its campus covers over 251 acres (1.02 km2) straddling the city neighborhoods of Larchmont, Highland Park, and Lambert's Point, approximately five miles (8.0 km) from Downtown Norfolk. Old Dominion University is classified as a Carnegie Doctoral, Higher Research Activity University. Old Dominion University provides nearly $2 billion annually to the regional economy. The university offers 168 undergraduate and graduate degree programs to over 24,000 students and is one of the nation's largest providers of online distance learning courses. Old Dominion University has approximately 124,000 alumni in all 50 states and 67 countries. Old Dominion University derives its name from one of Virginia's state nicknames, "The Old Dominion", given to the state by King Charles II of England for remaining loyal to the crown during the English Civil War. The foundations of Old Dominion University began in the minds of administrators and officials at the College of William and Mary in the first decades of the twentieth century. Notable among these men were Robert M. Hughes, a W&M Board of Visitors member from 1893-1917, and J.A.C. Chandler, the 18th president of that school. In 1924 after becoming the director of the William and Mary extension in Norfolk, Joseph Healy began organizing classes and finding locations for faculty and staff. He along with the collective efforts of Robert M. Hughes, Dr. J.A.C. Chandler, and A.H. Foreman, a two-year branch division was established on March 13, 1930. On September 12, 1930 the Norfolk Division of the College of William and Mary held their first class with 206 students (125 men and 81 women) in the old Larchmont School building which was an abandoned elementary school on Hampton Boulevard. On September 3, 1930 H. Edgar Timmerman becomes the Division's first director. "The Division," as it was affectionately called, which started out in the old Larchmont School building and allowed people with less means to attend a school of higher education for two years. Tuition for the first year was 50 USD. The following September, Virginia Polytechnic Institute, more commonly known as Virginia Tech, began offering classes at "The Division," expanding the number of courses taught. Old Dominion began educating teachers and engineers. Created in the first year of the Great Depression, the college benefited from federal funding as part of President Franklin D. Roosevelt's New Deal. The Public Works Administration provided funds for the Administration Building, now Rollins Hall, and Foreman Field, named after A.H Foreman, an early proponent of the college. Lewis Warrington Webb first joined the faculty in 1932 as an instructor of engineering and would later be called "the Father of Old Dominion." After serving 10 years as an instructor at the Norfolk Division of the College of William and Mary, he was appointed Assistant Director in 1942. He also served as Director of the Defense and War Training Program at the college from 1940-1944. Through its defense and training classes, the Norfolk Division makes an invaluable contribution to the war effort. The program also allows the school to remain open during a period when most young men were serving their country. The program attracts many women, who learn aircraft repair, drafting and other war-related subjects. In 1946 Webb was appointed Director of the Norfolk Division. Dr. Webb's dream was to see the Norfolk Division become an independent institution. The two-year Norfolk Division rapidly evolved into a four-year institution, and he saw that dream fulfilled in 1962 when the Norfolk Division gained its independence from William and Mary. On February 16, 1962, the William and Mary system was dissolved under General Assembly legislation which was signed by Gov. Albertis S. Harrison. Later that year the Norfolk Division was renamed to the Old Dominion College. Dr. Webb served as the first President of Old Dominion College from 1962-1969. Frank Batten, who was the publisher of The Virginian-Pilot and The Ledger-Star and member of the Norfolk Division's advisory board was chosen as the first rector of Old Dominion College on May 27, 1962. He held the position of rector until 1970 and the College of Engineering was named in his honor in 2004. In 1964 the first students lived on campus in the first dormitories, Rodgers and Gresham hall which were names after members of the advisory board. In 1969 Old Dominion College transitioned to Old Dominion University under the leadership of President James L. Bugg, Jr. During Bugg's tenure the first doctoral programs were established along with a university-wide governance structure in which faculty, administrators and students were represented. Bugg also re-established the Army ROTC program that was originally created in 1948 but was abandoned because of the outbreak of the Korean War. In the 1970s, during the tenure of President Alfred B. Rollins Jr. Old Dominion began mutual partnerships between regional organizations such as NASA, the U.S. Navy, Eastern Virginia Medical School and Norfolk State University. This was a result of Dr. Rollins goal of becoming the leading educational institution in the Hampton Roads area. Under Rollins, the university expanded its state and private funding, improved student services and introduced an honors program along with many other improvements to the university. In 1971 the university established its own campus police force and hired several police officers to patrol the campus. 1977 the Virginia Campus Police Act was made into a law, the university helped train local and campus police officers and the campus police officers were given full police authority on and around the campus grounds. From these humble beginnings the college grew southward along Hampton Boulevard, turning an empty field into a sprawling campus. After completion at the Norfolk Division, students would move on to schools offering degrees or would seek careers locally. "The Division" began by educating teachers and engineers. In 1962, it became an autonomous four-year college under the name Old Dominion College. Considerable growth in enrollment, the expansion of research facilities and preparation for the addition of graduate programs led the board to seek and receive university status in 1969. Since this time, the university has continued to grow and now has an enrollment of over 24,000 students. Within the Theatre Arts Department, Film and Video Studies is offered. The Department of Communication and Theatre Arts offers two degree programs that meet the needs of most students interested in film and video studies. The Program in Communication offers BA/BS degrees with an concentration in Film Studies. Classes focus on the principles and aesthetics of Film History, Theory, Genre, and Criticism. The Program in Theatre Arts offers a BA degree in Theatre with an emphasis in Digital Film making. Classes focus on all the practical aspects of digital filmmaking. The Department of Music is housed in the Diehn Fine and Performing Arts building. Diehn is the home of the ODU Symphony Orchestra (ODUSO), Wind Ensemble, Concert Choir, Jazz Choir, Jazz Ensemble, Monarch Marching Band as well as other smaller ensembles like the Diehn String Quartet and Diehn Chorale. Students at ODU pursuing a degree in music have a choice of bachelor's degrees in music performance, music education, music history, and music. The Diehn building also houses the Wilson G. Chandler Recital Hall, where performances of the Diehn Concert Series and student recitals are held. ODU offers several tracks of study within the English Department, including: literature, journalism, creative writing, linguistics, and professional writing. In Summer 2010, a new Public Service minor was started with the motto, "The Minor that Matters." This college is composed of five health-related schools and grants Certificates, Bachelor's Degrees, Master's Degrees, and Doctoral Degrees. The schools include the Schools of Medical Laboratory and Radiation Sciences, Community and Environmental Health, Nursing, Physical Therapy and the Gene W. Hirschfeld School of Dental Hygiene. Student housing has grown at ODU. The Quad, a collection of six new residential buildings--Ireland House (2006), Virginia House (2007), Scotland House (2008), France House (2009), England House (2009), Dominion House (2009)--and offices brings Old Dominion University closer to its goal of becoming a more residential university. Constructed alongside the Quad is the new student Recreation and Wellness Center. The center offers intramural and extramurals for the students and staff. ODU has expanded its sports facilities, recently completing the Folkes-Stevens Indoor Tennis Center and the Powhatan Sports Complex, a 48,000-square-foot (4,500 m2) facility that houses the intercollegiate athletic programs of field hockey, women's lacrosse, and football. Another football-related project was the renovation of Old Dominion University's historic Foreman Field for the sport's reintroduction in 2009. The Old Dominion University Libraries are the Patricia W. and J. Douglas Perry Library, the F. Ludwig Diehn Composers Room, and the Elise N. Hofheimer Art Library. The libraries contain over 3 million items--books, government publications, journals and serials, microform, musical scores, recordings, and maps. After months of renovation, the Perry Library first floor was transformed into The Learning Commons which opened in 2011. Established in 1995, the Real Estate Foundation has taken the lead in the development of the University Village, a mixed use development including retail, residential and office buildings. 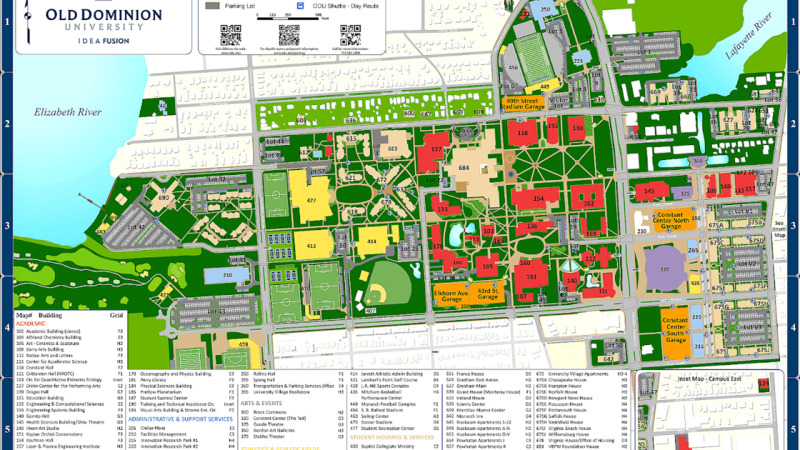 The results of its work are visible to all in the form of the University Village Apartments, restaurants, shops, the North Village Parking Garage, the Innovation Research Park, Marriott SpringHill Suites Hotel, and Campus Bookstore. Merchants Include: Perfectly Frank, Borjo Coffeehouse, Raising Cane's Chicken Fingers, Starbuck's, Sakura Sushi Bar, Tropical Smoothie Cafe, Zero's Subs, Recovery Sports Grill, La Herradura Restaurant, Mojo Bones, Insomnia Cookies, Jimmy John's. In 1999, ODU agreed to work with American Maglev Technogies of Atlanta to construct an on-campus student transportation link of less than one mile--using a smart train / dumb track design in which most sensors, magnets, and computation were located on the train rather than the track. With cost and safety concern, several other institutes of higher learning rejected the project. While projected to cost less to build per mile than existing systems, the ODU maglev was never operational. After depleting its $14 million budget, a groundbreaking was held in 2001, the project was completed in 2002; and the technology failed: the vehicle lost its "float" and come to a full friction stop on top of the rail, damaging much of the system. American Maglev and ODU dissolved their relationship and the project became an internal university research project. In October 2006, the research team performed an unscheduled test of the car that went smoothly. The system was subsequently removed from the power grid for nearby construction. In February 2009, the team retested the sled and was successful despite power outages on campus. ODU subsequently partnered with a Massachusetts-based company to test another maglev train. MagneMotion Inc. was expected to bring its prototype maglev vehicle, about the size of a van, to the campus to test in 2010. The Student Recreation Center is located in the middle of the ODU campus adjacent to the Rosane Runte Quad. The facility includes: 15,000 sq. ft. Multi-Level Fitness Center with Strength, Cardio, and Free-Weights, Indoor Swimming Pool, Indoor Running Track, 3 Court Gymnasium, Multipurpose Court, 3 Group Exercise Studios, Cycling Studio, 3 Racquetball Courts,Pro Shop, Outdoor Adventure and Rental Center, Bike and Skate Shop and an Indoor Climbing Wall. The ODU Army ROTC battalion was established in September 1969 in the Darden College of Education. The first cadets were commissioned on July 4, 1971. As of spring of 2008, ODU has been recognized as having the sixth largest Army ROTC unit out of 262 programs found nationwide. Its Navy ROTC program is run in conjunction with the neighboring campuses of Norfolk State University and Hampton University. The Hampton Roads Naval Reserve Officer Training Corps is one of the largest officer training battalions in the US, consisting of over 250 Sailors, Marines, and Midshipmen, with an above average prior enlisted presence. Old Dominion has a complex and diverse Greek system with fourteen fraternities and eleven sororities. Greek life is not active at Old Dominon, 6% of men are in fraternities and 5% of women are in sororities.There are also a wide variety of service fraternities active on campus. On March 2010, Dr. Wood Selig became the new athletic director. Previously, Dr. Selig was the athletic director at Western Kentucky. On May 17, 2012 Old Dominion announced it would move to C-USA on July 1, 2013. Four ODU sports which are not sponsored by C-USA have outside affiliations. In 2013, the Wrestling team became an associate of the Mid-American Conference and the field hockey team joined the reconfigured Big East Conference. The women's lacrosse team spent the 2014 season (played in the 2013-14 school year) as an independent before joining the Atlantic Sun Conference. Finally, the women's rowing team joined the Big 12 Conference in 2014-15 after the Big 12 effectively took over C-USA rowing. Most recently, the men's swimming and diving team, which was left without a conference affiliation for two years because C-USA sponsors the sport only for women, joined the Coastal Collegiate Swimming Association, later renamed the Coastal Collegiate Sports Association, effective with the 2015-16 season. The Old Dominion Lady Monarchs basketball team has won three national championships. In 1979 and 1980, the Lady Monarchs were AIAW Champions. In 1985, they captured the NCAA Division I National Championship with a 70-65 win over the University of Georgia. In addition, the Lady Monarchs have captured five Sun Belt conference championship titles (1983, 1984, 1985, 1987 and 1990), and captured 17 CAA championship titles, winning every year from 1991-92 to 2007-08. Led by head coach Carmen Harris, the Old Dominion University cheer squad is a safe, professional and athletic program. Its energetic team consists of athletes who are also students. The cheer squad, along with the Old Dominion Dynasty Dance Team, performs at all football home games as well as most football away games. They also perform at all Men and Women's Basketball home games, and occasionally a home soccer or baseball game. Along with their practices, games, competitions, and other events, ODU cheerleaders are required to actively participate in all fundraising efforts and volunteer work under their Spirit Squad Program. The Old Dominion Athletic Foundation (ODAF) is the official booster club for Old Dominion Athletics. the Old Dominion Athletic Foundation was previously known as the Big Blue Club, or The Old Dominion University Intercollegiate Foundation. The change from those to ODAF occurred March 1, 2011. The Old Dominion Athletic Foundation has an 501-C-3 designation as a non-profit organization.